The tortilla I am referring to is not the Mexican type, packed with everything you can get your hands on. Spanish tortilla translates as omelette. It's a great comfort food served for lunch or dinner, (even cold for breakfast). It transforms simple ingredients into a meal almost fir for a king. OK, there are basic ingredients here that most people would already have at home. Potato, onions and garlic (kept in the larder to avoid sprouting), and those other ingredients one would keep in the refrigerator, such as asparagus, prawns, mushrooms and of course eggs. 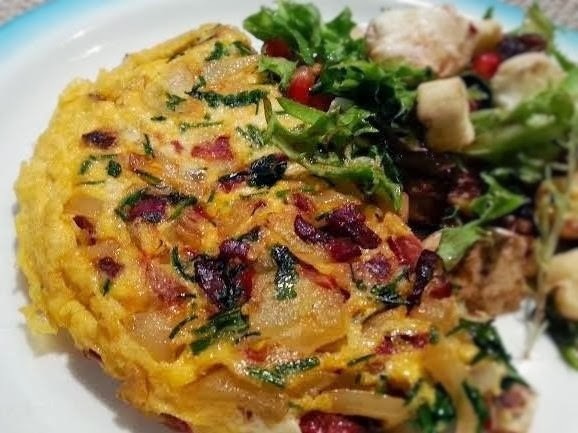 Spanish tortilla is incredibly versatile and you can make changes every time to suit your taste. Cooking is about experimenting with flavors after all. Now, where was that lemongrass...? 1. Pre-heat oven to 175ºC. 2. Heat the oil in a large sauté pan over a medium heat. 3. Add onions and red pepper and cook until tender. 4. Add chorizo, potatoes, garlic and coriander stirring carefully. 6. In a large bowl, whisk eggs with an extra pinch of salt. Add eggs to pan with the chorizo mixture. Stir gently with a spatula allowing the bottom to cook, pulling away at the sides to allow the uncooked eggs run underneath. 7. When the eggs are nearly set, place pan in the oven for until set on top. 8. Remove from oven, invert tortilla onto plate and cut into wedges.